Which parts of your car end up as landfill? Each year, around 10-15 million vehicles are disposed of in the United States. Luckily, over 95 percent of these “retiredâ€ cars head straight to one of the 9,000 vehicle recycling operations around the country and 80 percent of these cars' parts are completely recycled, letting cars claim top spot as the world's most recycled product. Because vehicles are made up of many different materials, recycling them isn't a completely straightforward process. Here's what happens to the various parts of your old cars. As the hottest commodity at the moment, steel, iron and other metals comprise about 65 percent of the average vehicle, making the reuse of this product vital to overall automotive recycling efforts. Although reuse of metals started alongside the advent of the automobile, they're more popular than ever before. With construction exploding in rapidly developing countries like China, traders are snatching metals up to sell, and some older cars are now actually worth more for their steel than for their originally intended function. Naturally this means, according to the Steel Recycling Institute, that virtually all of this material is recovered for reuse. Wheels, engines, transmissions, wiring and body shells get shredded and filtered by ferrous scrap processors and the material is then sold to steel mills. Your trashed ’79 El Camino could be having a second life as a part of a Indian skyscraper. Seventy percent of all lead now used in the U.S. is found in car batteries. Fortunately, we’ve known about the toxicity of lead for long enough that recycling systems have been in place for years. Some batteries have enough life in them to be reconditioned for resale, but the dead ones go to lead reclaiming plants where the toxic substance is extracted to use in new batteries. According to the EPA and the Rubber Manufacturers Association, approximately 300 million tires are discarded in the U.S. each year. That's a helluva lot of miles driven. The good news: While today’s tires are complex, they are also extremely recyclable, and we reuse 86 percent of those tires. The rubber from old tires finds its way into a multitude of materials, from pavements to playground covering. Some are used to create more tires, tens of millions are retreaded annually – though very few of those are for passenger cars, due to economic factors. They are also able to fuel cement kilns, boilers and paper mills. Engine oil has to be changed so frequently that its recyclability is incredibly important. 800 million gallons are reused or recycled each year in America. It goes through a refining process and comes out squeaky clean (well, for oil) as a base stock for lubricating oil. Despite this, Irresponsible do-it-yourselfers manage to send an estimated 200 million gallons down the drain. Take the used oil to a collection center, local auto parts store or garage instead. That goes for used gear oil, windshield wiper solution, brake fluid, power steering fluid, antifreeze and transmission fluid too. They can contain some seriously toxic substances, including lead and the highly poisonous ethylene glycol, but if you drop any of these fluids off at a collection site, they can either be blended and utilized as an alternate fuel source or restored. The recyclability of certain materials has eluded experts for years. Glass is just one such problem. Those windows protecting you from errant rocks and bugs are coated in a laminate, and sometimes have defrosting wiring and tinting, all of which complicate the recycling process. 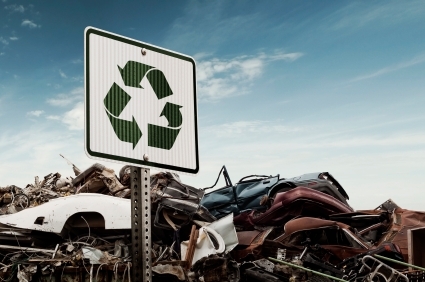 While we've come far in our auto recycling efforts over the years, the amount we are unable to reuse adds up quickly. However, with renewable resources and environmental protection on the forefront of design and manufacturing now, the time when we should start seeing recycling hit new levels of success is right around the corner.